Phil Collins has contemplated killing himself, and would always pick an option that “didn’t hurt”. I so identify with this story. I too have contemplated killing Phil Collins. Okay, only in my imagination. My imagination can be quite vivid, however, and, Phil, I’m afraid you suffered greatly during your death, which was slow and extremely messy. The star admits his latest marriage breakdown and criticism of his solo material left him so depressed he considered ending his life, but the thought of his children stopped him. Where were those thoughts when he was making No Jacket Required? Why wasn’t he thinking of the children of the world before he unleashed Billy Don’t Lose That Number upon us? The star lives in Switzerland, and one of his main pastimes is collecting things linked to the Battle of the Alamo, which was part of the Texas revolution in 1836. He is so interested in the event he wonders if he was involved with it in a past life, and he also regularly sees orbs. It’s called the moon, Phil. Of course the Buddhists believe in rebirth. One wonders, however, what kind of creature he must have been to be reincarnated as Phil Collins. He must have hurt a lot of people. But that’s probably enough sneering from me. I don’t exactly come to this thing with clean hands. For I have my own secret to share, a dirty secret I’ve been hiding away for many years. 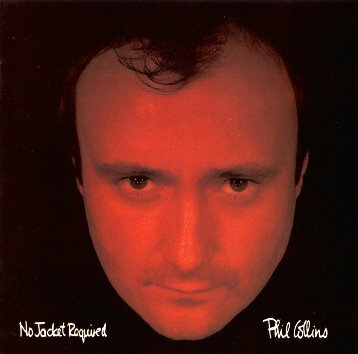 You see, the first piece of music I ever purchased on my own was a cassette tape of No Jacket Required. Oh the shame! But I was so young, and those toe-tapping tunes led me astray. And I still think this is a good song. It has a killer drum track (he’s always been a good drummer, even if listening to Another Day in Paradise makes me want to go out and attack homeless people). It’s just a pity he kept making solo albums after this. 12 November, 2010 in Phil Collins.